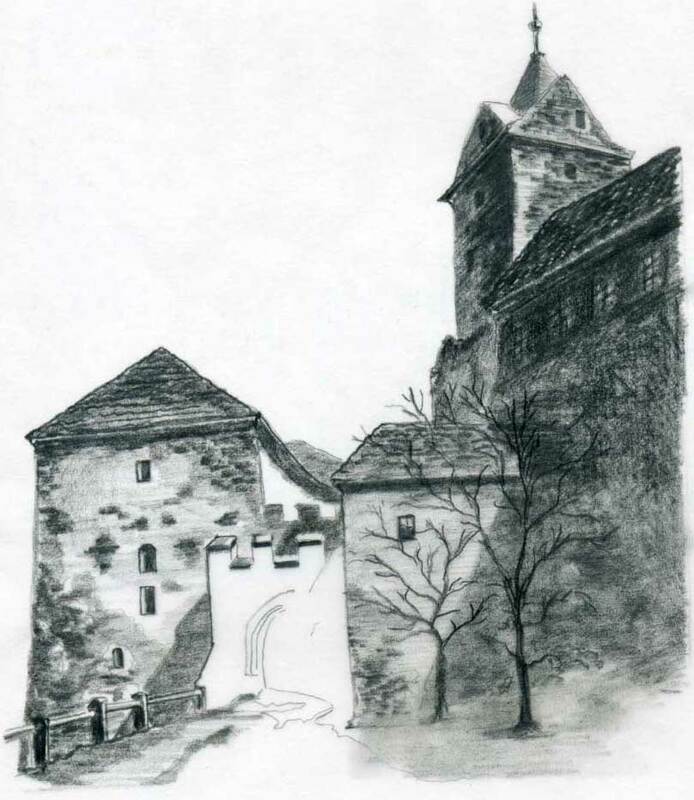 I am very happy you are interested in castle drawings and my special thanks to you that you are here. Welcome to the medieval Europe. This is a very interesting and very mysterious topic full of unexpected things. 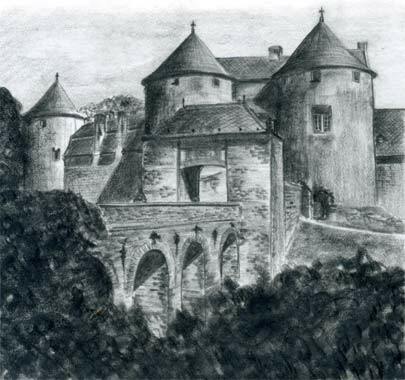 Drawing castles allows you to use your fantasy. For me, castles equal history in “real estate”. 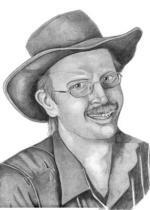 So many stories, human dramas, tragedies end legends are hidden behind their thick 900 years old stonewall. Many of them are only ruins, but just imagine how real people built them. I can hardly explain by words the goose bumps, the feeling you experience when you are there when the giant soars right before you. I am lucky being born in central Europe where the medieval castles are sprinkled throughout the countryside. 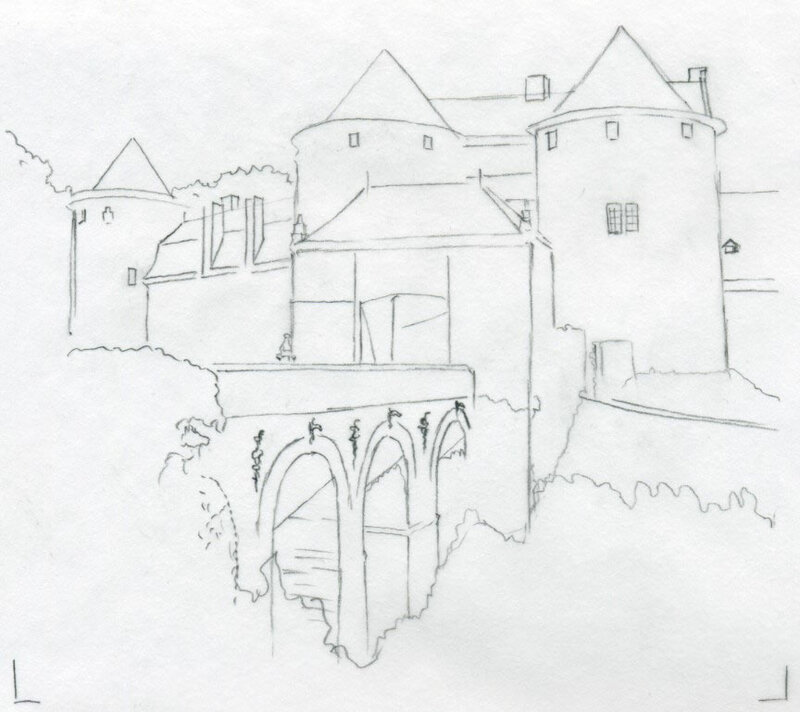 It offers you countless opportunities for castle drawings. 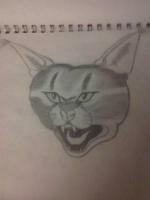 Very nice pictures to copy are old drawings, carvings or lithographs. They are simple but have the power to convey the reality from those ages. 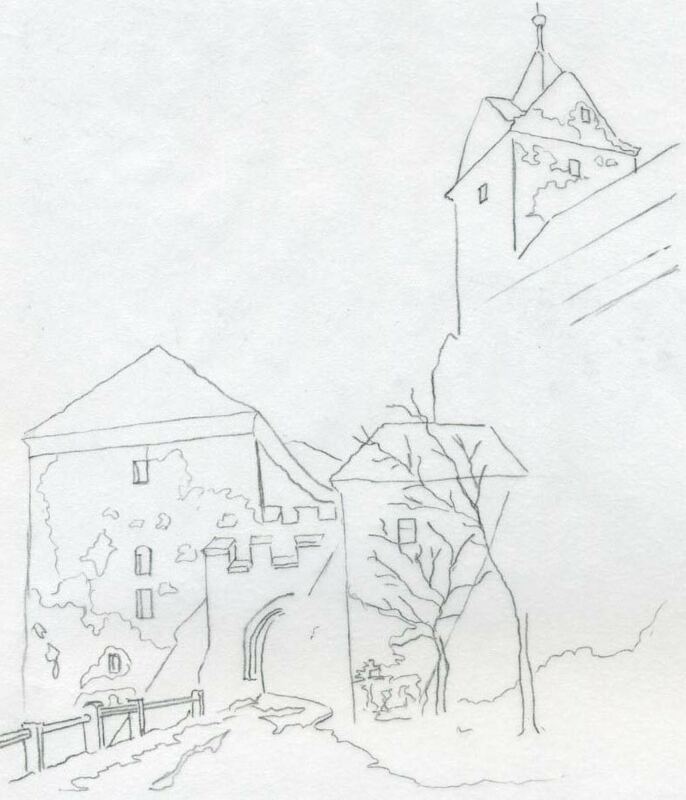 On the picture above is a simple and rather easy to copy castle drawing of the entrance gate area. It is in fact very real, just as if you are about to enter to the castle. Click on the picture to enlarge, it will open in new tab or window. Print it out and let’s go to the next step. 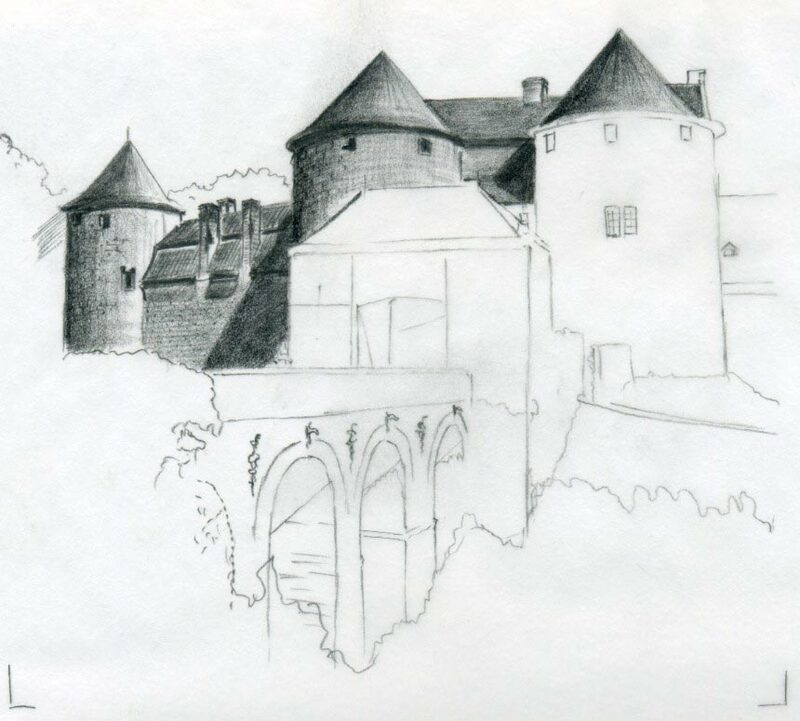 Draw a weak pencil outline of the castle’s main features or simply trace it by tracing paper. Start from the left side if possible.Draw the roof, small arrow loop openings on the lower building – turret. The gate has a Gothic style opening, so it might be that the castle was built in that period. 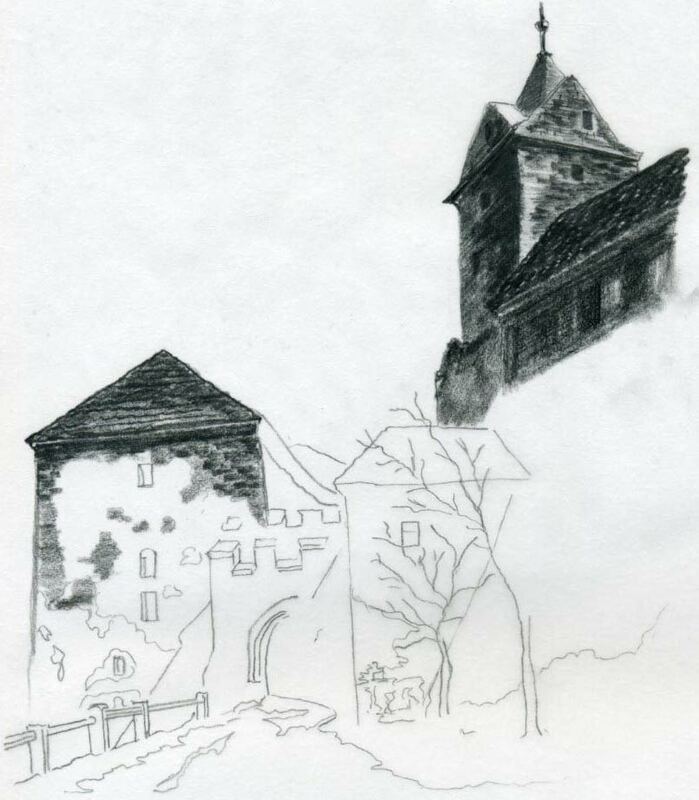 Also, make markings of damaged parts of the walls; we shall shade them darker or point out the building stones. 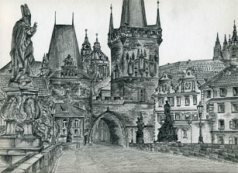 This work is very helpful and necessary because you will have the total outline and the shape of the castle drawing ready so that you can concentrate on the “coloring – shading - work”. Start the shading work from whichever part you like. I did it from the top right tower. Since this is a pencil drawing, use a piece of paper under your right hand (karate chop part) that directly touches the drawing paper, not to smudge the drawing. See that the roof tiles on the building right under the tower are wavy shaped, so make wavy lines to create more realistic drawing. The wall of the building on the right under the tower is in shade, it is dark and you need not to put much attention onto details. However, the windows should be slightly featured. They are weakly visible but they are there. It is enough to just roughly sketch these shady darker parts. The wall that is most visible is the lower building – turret on the left side, left from the entrance gate. There we shall pay a little more attention and work it out nicely. Use your fantasy. The symmetry of the building should be obeyed but the parts where the building stones are visible can be virtually anywhere. Mostly are visible on the corners. In similar fashion, shade the rest of the buildings. Be careful however, while shading the roofs. Roof tiles should be pointed out. You can smudge them by cotton swab later but the shape should indicate that it is a roof. Your drawing will look much better. The gate still remains white; we shall shade it in next step. Notice however, that the sunlight is coming from the right side. Therefore the shade of the entrance gate part is visible on the turret wall on the left. Similarly the diagonal shadow cast on the turret on the right side of the gate. Guard rails on the left side of the road were probably built recently. You can draw them but need not if you don’t want. Last step is to finish the gate itself. Pay special attention to the visible folds on the left side of the Gothic gate opening. This gate seems like some short tunnel so shade it just dark as you see on the picture. Again, use your fantasy wherever possible. I did not draw leaves on the trees in front of the right side turret but you can do so and, your castle will look like a summer drawing. You can also add clouds or ravens or whatever. Use your fantasy. These types of castle drawings can be well made in sepia color, so that they will be even more impressive and more authentic – “old looking”. This is a beautiful medieval castle in Belgium built around 1270 by the Count Philippe of Vianden and his wife Mary of Brabant. I like this scenery very much and I couldn’t help but draw the castle. This drawing may look a bit more complex but it only looks like that. 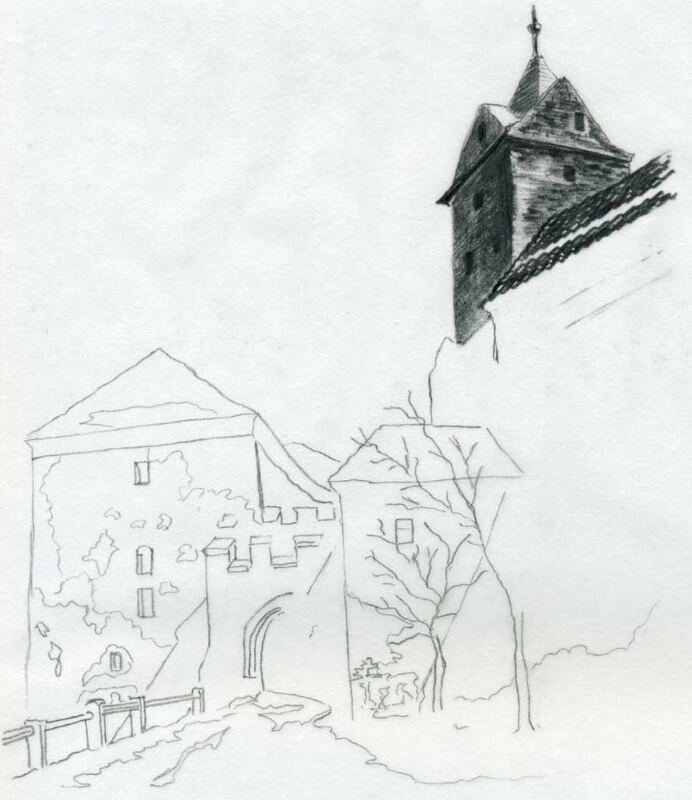 It is very helpful to just “decompose” the drawing into smaller parts like: tower, gate, bridge…etc. Such imagination technique will help you not to be scared when you suddenly see a complex object. I showed and explained in detail this decomposing technique in drawing carnation section. you can apply this technique on virtually any object not only on carnations or castle drawings. 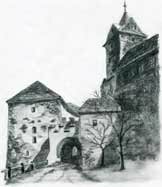 It is good to keep in mind that most of the castles are medieval architectural objects, which are usually complex for several reasons. Castles were usually built on the top of the hill - mostly rocky hill. Such terrain does not provide much building options so the builders had to utilize every possible piece of ground or rock. They could not adjust much the ground; instead they had to adjust the shape of the building complex. Yes there are plenty of castles built on the flat land and these castles were probably built in more or less symmetry and, thus they are easier to draw. 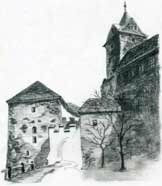 Many of castle drawings that I would like to introduce to you are medieval, top of the hill built buildings. You can find these castles in many places throughout Europe. Many of them are only ruins but you can often find a rest of the original majesty in the ruins as well. 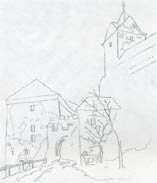 Draw the outline of the castle by simple and weak pencil line. You can use HB sharp pencil for the initial outline drawing, so that you can keep the same thickness of the line all the time. Draw by free hand, do not use ruler! When you have ready the outlines we can start to shade each building from left to the right, or from right to the left if you are left-handed. Please use a piece of paper under the palm of your drawing hand that rests on the paper while you work, not to blur your drawing. 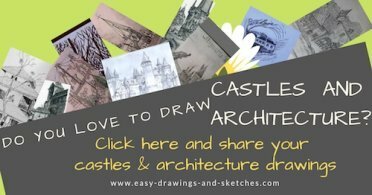 When we draw architectural objects like castle drawings, we usually decide where the sunshine or the daylight source will be coming from. In this case it is from the upper right corner. This is something you can easily get accustomed with. Based on the daylight source you will know how to shade the castle’s buildings. Very simple ideas about how to shade any object are in warming up exercise section. Click on the images to enlarge and see how I worked out the parts of the castle. I used simple strokes (as usual), crossing or lining up on each other to get a darker tone. When you draw the roof pattern, just shade the roof first and then with sharp pencil, make crossing lines resembling to the roof tiles. Draw these lines gently, they must look almost like a shade. A good example of roof tiles is the gate-roof on this castle It should look like this or better. Castles are stone built. 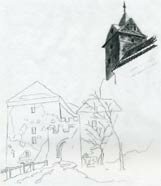 You can emphasize the visibility of the stones on your castle drawings by short simple pencil strokes around the corner areas on the walls. One of the best ways of marking the stones is by flattened tip of the pencil. This method works well for me, so I recommend it because it allows you to draw these “stone-details” fast and easily. The following pictures may seem a bit complex. 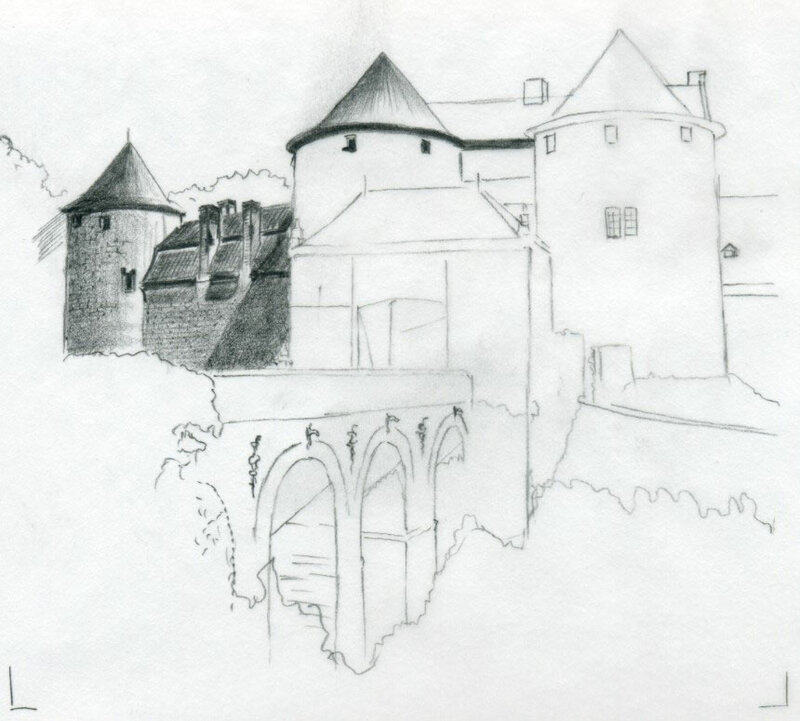 They are not exactly castle drawings. 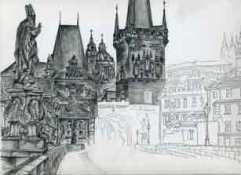 It is view on scenery from Prague’s Charles Bridge. This historical architectural mix is beautiful. 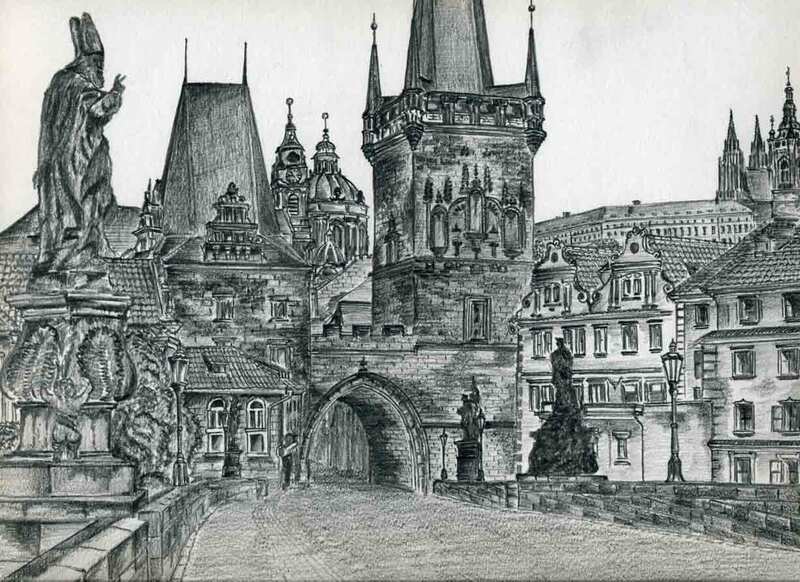 It is located right under the Prague’s Castle. Because of this “too much complexity” I decided to copy – to trace first the silhouettes and outlines. To create a so called “coloring page” base, although the only color that I used was a standard graphite pencil. On this drawing you see half of the picture is ready with all details and half is still only a silhouettes. It is quite a tedious work, drawing all details on those historical buildings but the final effect is good. This picture took me about 2 hours to draw only the silhouettes first. I did it in one evening. Next day it took another 5 hours to fill up all details. 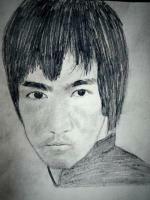 I made it all by HB pencil. 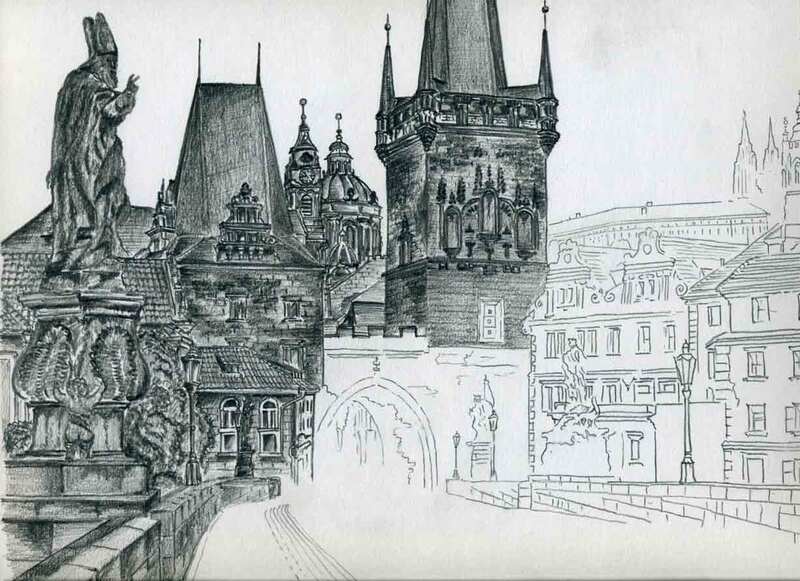 It is a good exercise to also draw old town scenery instead of castle drawings. How To Draw Killer Whale. Any Beginner Can Do This! Learn to draw killer whale in few super easy and simple steps. Perfect lesson for beginners. 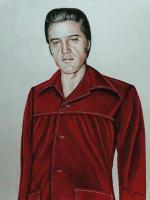 See the awesome Andy Leslie's realistic portait drawings. This is epic stuff! How To Draw Spider. Simple Tutorial. Learn how to draw spider. Any beginner can do this with ease.